The obvious reasons for our excitement upon returning home were familiarity and comfort, but the other reason was simply the sheer fact that home is San Francisco. I had looked forward to satisfying my thirst for wanderlust, but unlike many travelers, I had not planned on using travel as a means of escape from uncertainty. Preoccupied with an amazing career and countless hobbies, sports, activities, and friendships, I at times wondered myself why I was leaving behind the dream life to embrace the unfamiliar arms of culture shock and scams. 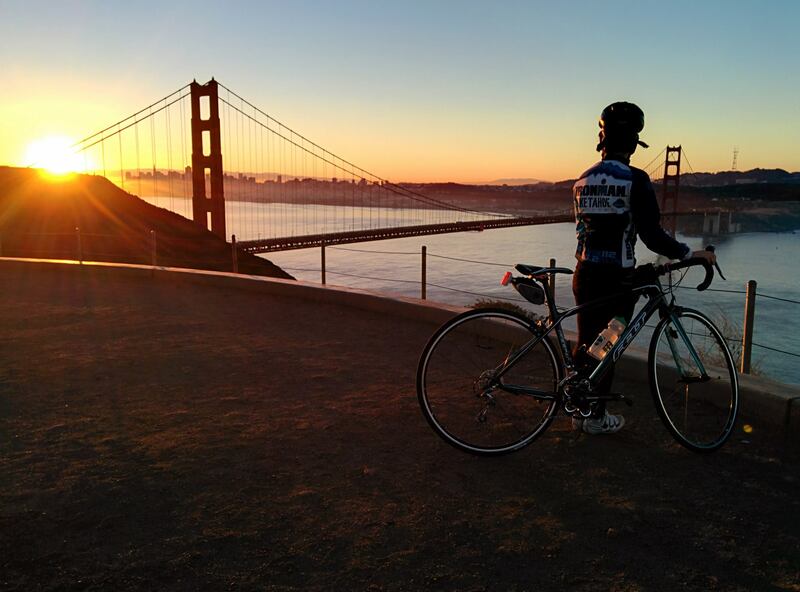 But the answer was obvious–my heart yearned for new challenges that exist far beyond the pressures within the office and the physical and mental hardships of endurance sports. In addition to constantly being surrounded by such positive energy in the years leading up to my travels, I also had the fortune of calling the beautiful city of San Francisco my home. Not San Jose. Not Walnut Creek. Not Palo Alto. SAN FRANCISCO. Too many people who live in the Bay Area tell their foreign friends and family they live in San Francisco which paints a culture quite opposite of their actual suburban city that lies in the shadow of San Francisco. I often find myself allowing the little modesty I have to succumb to my obvious pride for this city, for every foreigner I had met overseas sighed in delight when I informed them of my whereabouts. “Where are you from?” they would ask. “San Francisco,” I’d proudly answer. “Ooohhh…that’s like a dream [to live in San Francisco],” a Chinese woman sighed in Siem Reap, Cambodia. “Wow, you are so lucky to be able to live there,” an Australian woman told me while trekking in Kalaw, Myanmar. “I LOVE San Francisco!” exclaimed a German woman from Hoi An, Vietnam. “We’ve never been, but we’ve heard so many great things about San Francisco from our friends who have visited,” a Swiss couple told me at Inle Lake, Myanmar. “I’ve lived all over the world, and San Francisco is the most beautiful city I’ve ever lived in,” an Eastern European man once told me. Looking forward to going home is one thing, but when your home is situated on a San Francisco hill with sweeping views of the city, it takes the longing to a whole new level. We were finally home. We could now walk down the street to the local markets to buy our favorite cheeses and produce without the headaches of bargaining. We could go on our beautiful jogs along the bay and inhale the fresh, salty air. We could dine at our favorite, little neighborhood restaurants and sip on fresh coffee from the barstools of our local bakery. We could observe the Chinatown fleece-adorned tourists scurrying around the city, clutching onto their maps and speaking in their native tongue. We could appreciate the charming sounds of San Francisco from our bedroom window: the early morning fog horn that bellows from the Golden Gate Bridge, the hum of the cables that pull the cable cars up the hills outside my home, the hiss of the bus’s transmission as they stop and go across the street from our front door. We could sleep in our own bed and stir from slumber to the soft murmurs and bright white overcast skies of one of the most beautiful cities in the world. In addition to looking forward to San Francisco, our primary purpose for our return home was to attend the notorious week-long arts and music festival called Burning Man. I’m not going to make the futile attempt to define Burning Man. There are already too many blogs out there dedicated to that. I also won’t bother turning this blog post into a photo blog of Burning Man. There are too many sites out there that showcase the high quality photos of professional photographers such as this photo gallery and this one. 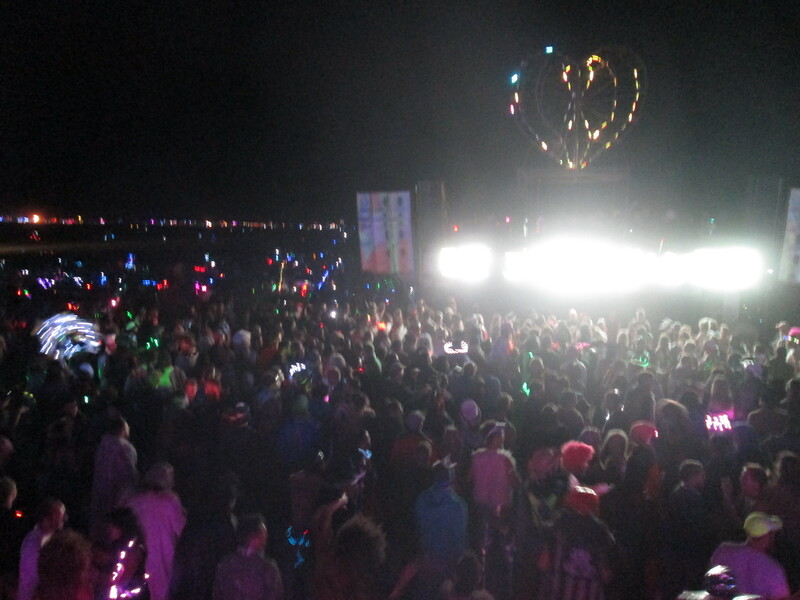 Instead, I want to focus on how Burning Man makes me feel. Burning Man reminds me that life is worth living. Year after year tears of joy swell in my eyes amidst long embraces in the center of a dancing crowd. There is no where else in the world where a peak of 60,000 people gather to celebrate art, music, community, and life. Hugs replace handshakes and strangers greet others with a warm, “Welcome home.” The hippie thoughts of joy, peace, love, and friendship are contagious; happiness is at times overwhelming. During those moments of pure bliss, I often pause to gaze at the closed-eye, smiling crowd and tell myself, “This is what life is about.” Life is about being happy, having fun, and enjoying it to its fullest potential; if it’s anything other than that, it’s not worth living. 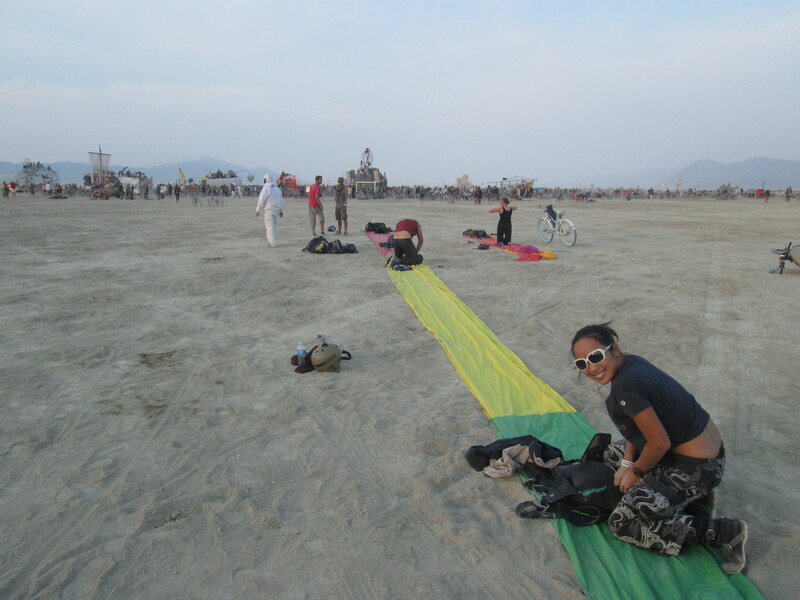 Burning Man transforms me into the person I typically judge in the default world. Everyone is guilty of judging; some just do more than others. I admit to being that grumpy, old lady far too often and I catch myself judging all types of people whose lifestyles clash with mine. But at the end of the day I remind myself that as long as they are not hurting others, there is nothing wrong with their decisions and actions. At Burning Man I am no longer restrained by the hindrance of society, and I can act, think, and do freely there more than anywhere else in the world. No one cares. I don’t care. I become that person that I once judged, and when I return to the default world, I look at people and life with a layer of empathy that was once lacking. I arrive on the playa with curiosity and eagerness, and I depart with a heart and mind more open than it ever was before. Burning Man exemplifies the goodness humankind is capable of. In the default world we are constantly reminded of the incredulousness of humans as seen in religion, wars, science, technology, communities, etc. More often than not I find that the power of humankind carries a negative backlash due to what we’ve seen in history. Out in Black Rock City, we are given the opportunity to see beyond that. The grandioseness of the art and music and their ability to touch souls is a reminder of how the power of humankind can actually be good. 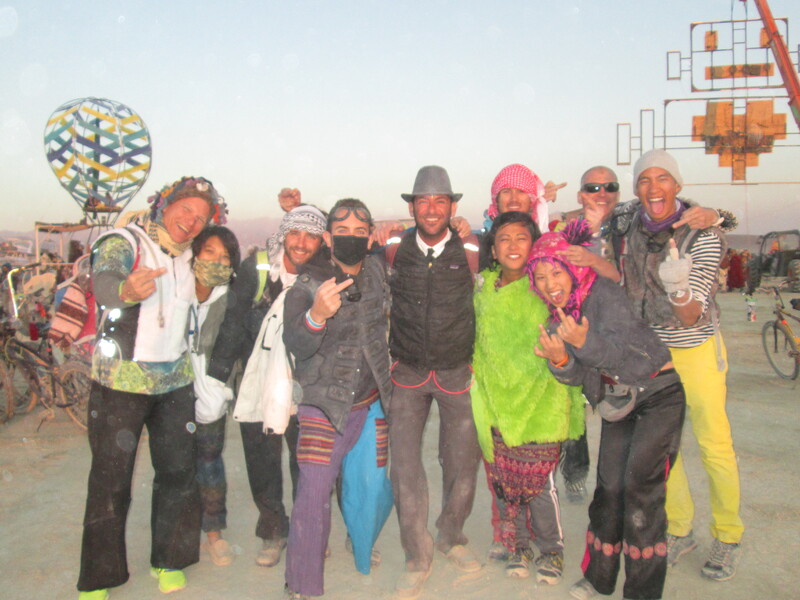 Burning Man not only strengthens the bonds of existing friendships, but also creates new, everlasting friendships. 24-hour dance parties bestow the rare opportunity to mingle and dance in the open air until the stars fade into sleepy, crimson clouds. Hours can be spent lounging around in hammocks, chitchatting the day away in lieu of biking in the dusty heat. Interactive art installations are scattered throughout the desert and are best experienced with friends and strangers. And when hunger or thirst takes its toll, there isn’t a bartender or chef too far away who loves to hear how delicious their beverage or meal tastes. No, this wasn’t my first burn. This was my 5th and Chris’ 6th, and our first time staying on the playa for two weeks (early arrival for camp setup and late departure for teardown). 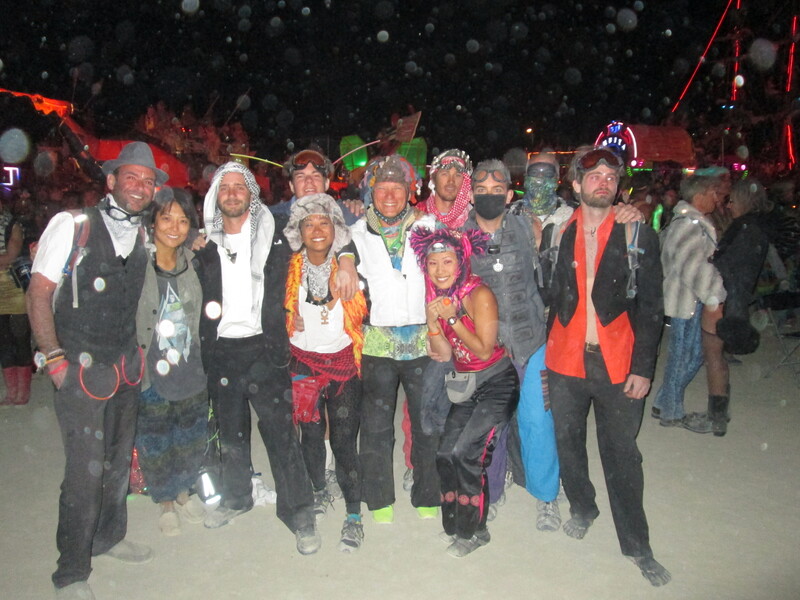 Despite having attending Burning Man for the past consecutive 5 years, this is my first blog entry about Burning Man. Each year at Burning Man is another year I’ve grown, and each year is filled with thoughts and opinions that alter with maturity and wisdom. 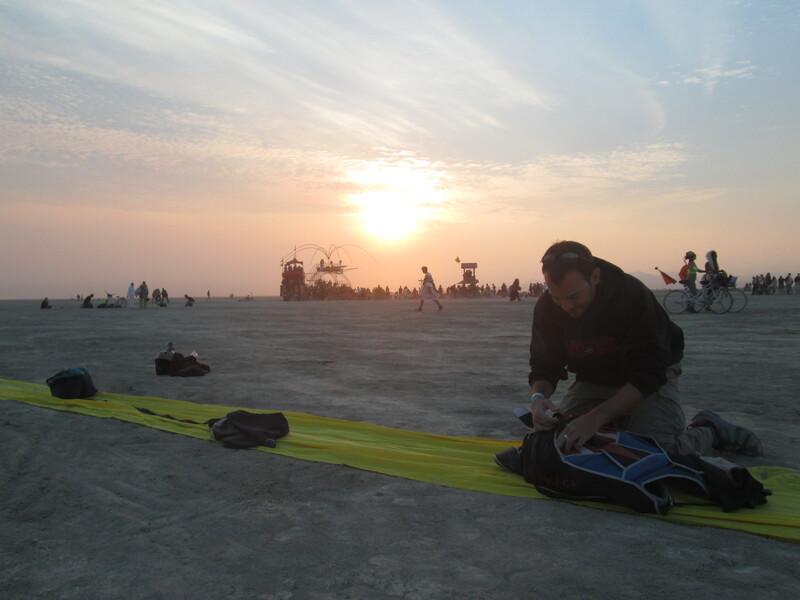 I’m glad that I’ve waited several years to reflect upon and write about Burning Man (which are now intermingled with recent life-changing experiences from abroad) to produce a more fruitful account on what Burning Man is to me. This entry was posted in Nevada, Uncategorized. Bookmark the permalink.